The planning process for my hike on the Pacific Crest Trail was a long one and I wanted to be prepared. 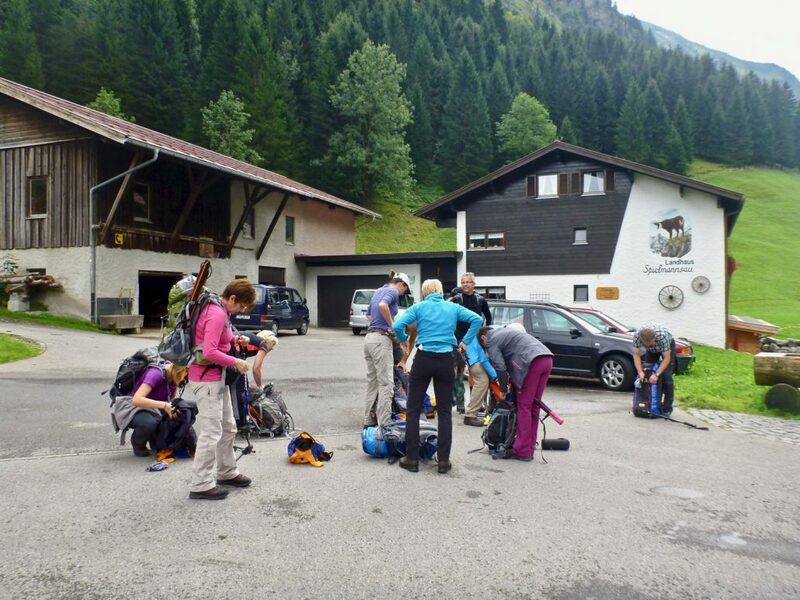 Therefore I booked my very first guided mountain tour in the European Alps. 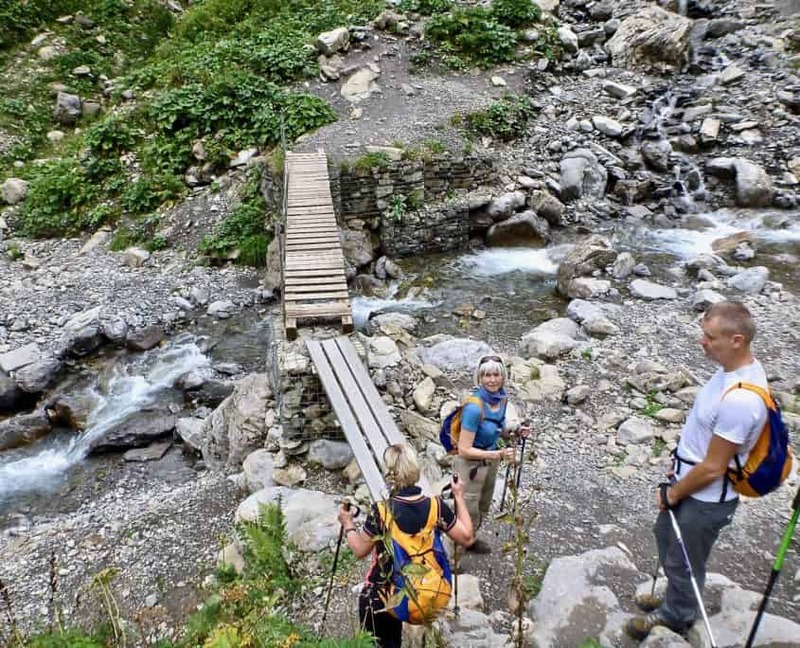 I decided for the famous Alpine Crossing from Oberstdorf to Meran. 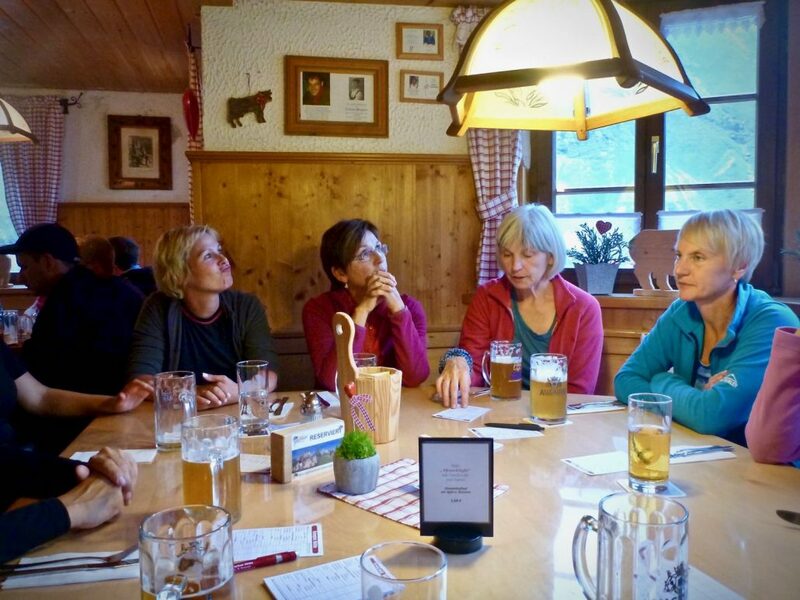 With mixed feelings – as I didn’t know what to expect – I booked the tour with a local Alpine School in Oberstdorf. I would attempt the tour as a single and when I booked it I was a little scared of getting stuck with lots of couples in the group. It should turn out completely different and in the end the Alpine Crossing was much more than “just” some preparation for the PCT! 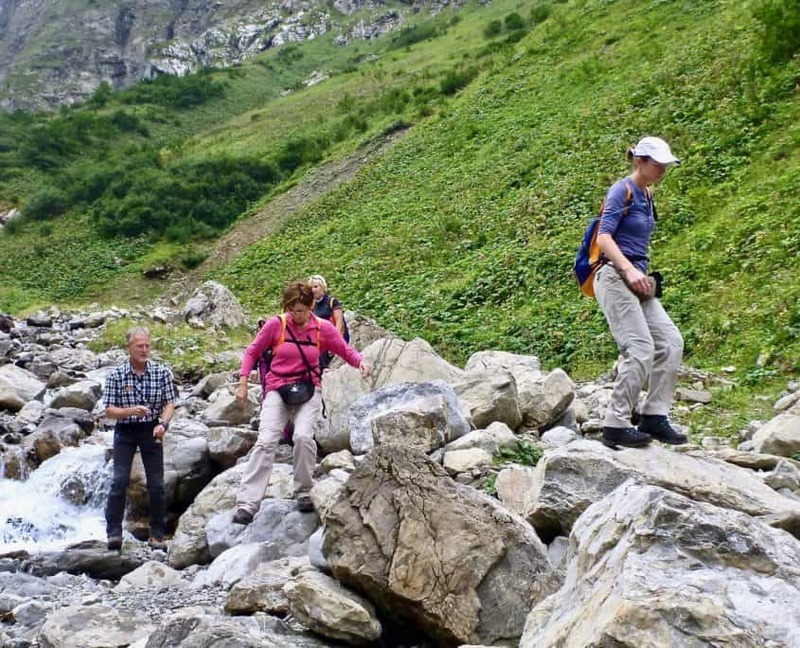 For all those who are interested in hiking in the European Alps I decided to share my memories of this great and unforgettable hiking experience! 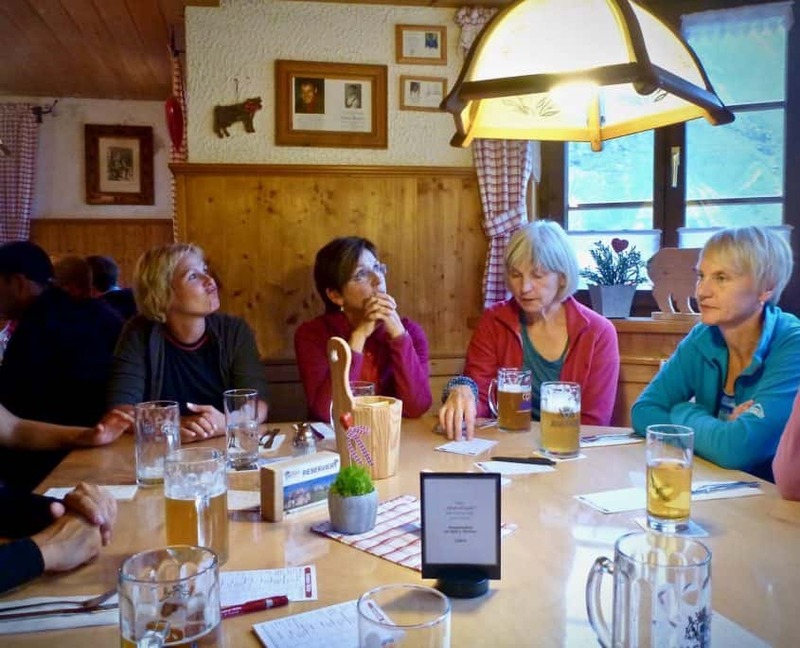 It was around mid-day when I arrived at the Alpine School in Oberstdorf. I checked in at the office and sat down in the waiting area. Curious about who my fellow hikers would be I had a close look at every one who entered the room. It turned out that we were a goup of eleven people including our mountain guide. Prior to booking I was a little bit scared of being stuck with lots of couples but our group was totally different: There were four women from northern Germany that knew each other from a sports lesson, there were three other single travelers from the middle of Germany and there was one couple from the Netherlands. And there was me. Last but not least our mountain guide Edi who was busy right from the start to make sure all our backpacks don’t weigh too much. The allowed maximum was about 9 kg. As soon as we finished the optimization of our backpacks we were ready to go. A small bus picked us up and drove us to an elevation of about 1000 meters to a place called Spielmannsau. 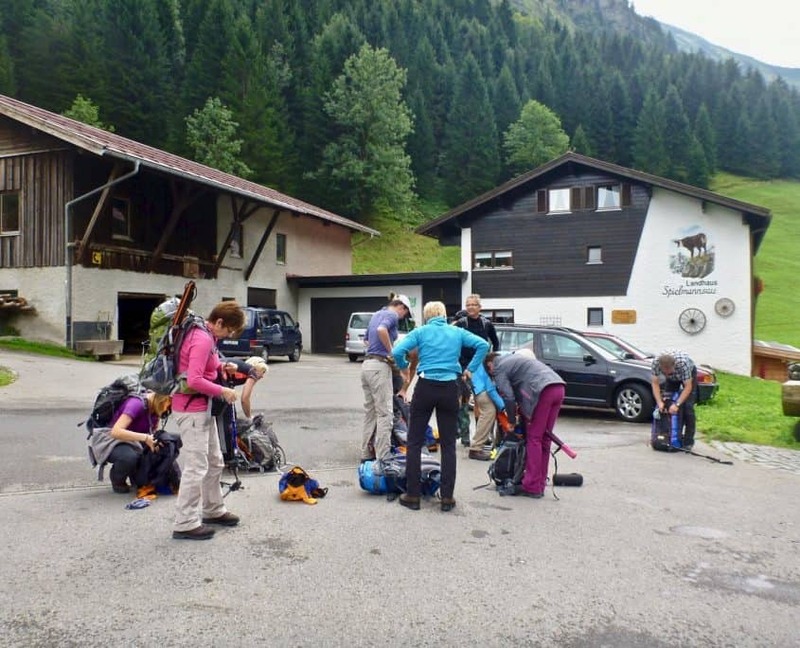 On our first day we should hike from Oberstdorf to Kemptner hut. Arriving at Spielmannsau we had to prepare for our first ascent. We hiked just a short distance to a small hut with a ropeway for material transport. It is very common in the European Alps that the mountain huts maintain these ropeways. As a hiker you are often welcome to use them for your main luggage. And so we did. Edi, our guide, organized everything. He called the hut warden and made sure that our luggage got safely up the mountain. All we had to carry on our first ascent of about 870 meters was a small daypack with the essentials like rain gear, a little snack and something to drink. We started our hike on a trail along a river leading us through green bushes. 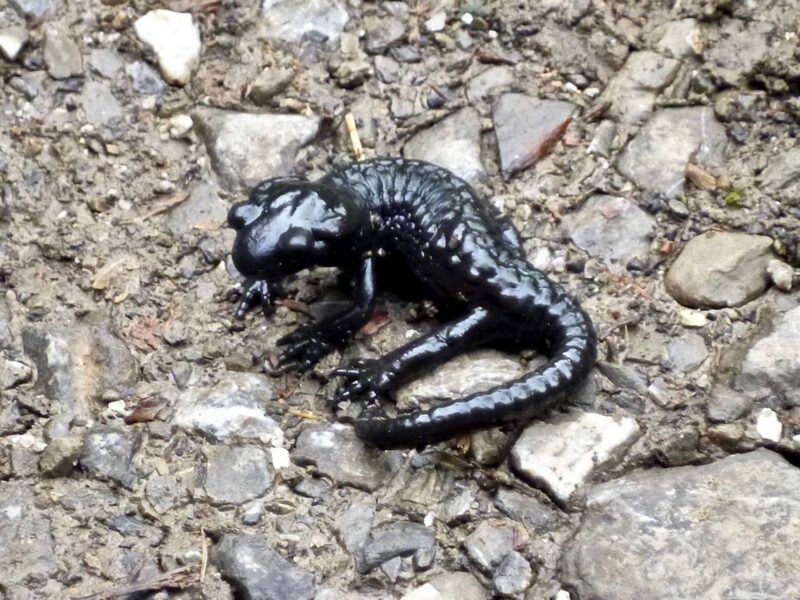 Not very long and we could see our fist mountain animal! Very soon the landscape changed and we climbed up a mountain side and crossed small streams. 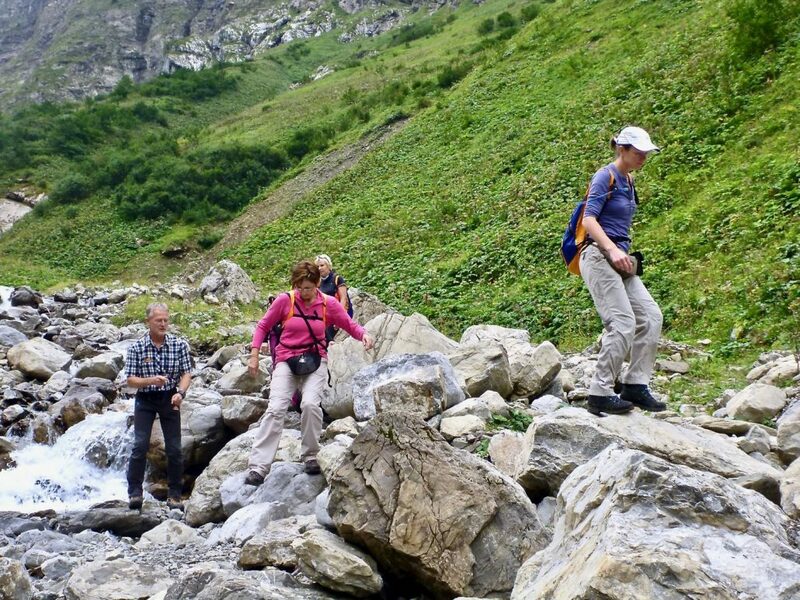 When we came to a stream with lots of big boulders around it our guide Edi told us to stop. He made us walk on the stones in different angles. We had to try different things and got more confidence in walking on rocks. “You have to get to know your shoes” as he said. And it was really helpful to try different angles and techniques without the risk of falling down! Afterwards I knew what I could do with my shoes and on what terrain they would start sliding. 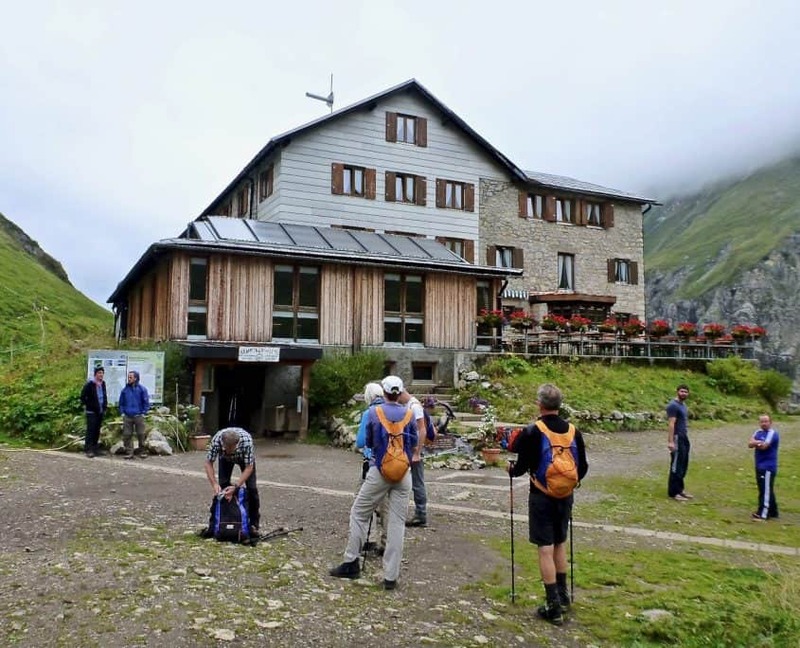 After a hiking time of about three hours we finally arrived at our first home for the night: the Kemptner hut at an elevation of 1844 meters. We picked up our big backpacks at the upper end of the ropeway and our guide taught us the hut rules that are most important to follow. There is for example a room where all the hikers have to leave their hiking shoes. Did you know that it is a good idea to bind your shoes together? Or even bind your left shoe to the left shoe of a hiking partner and the same with the right ones? When people get drunk on the hut and go out at night they often don’t care if they pick the right shoes. But if they pick two left ones they might realize that something is wrong. In the next days I would find out how important that rule was! After a quick look into our shared rooms we got comfortable around a table in the hut restaurant. We even witnessed a helicopter landing in front of the hut. 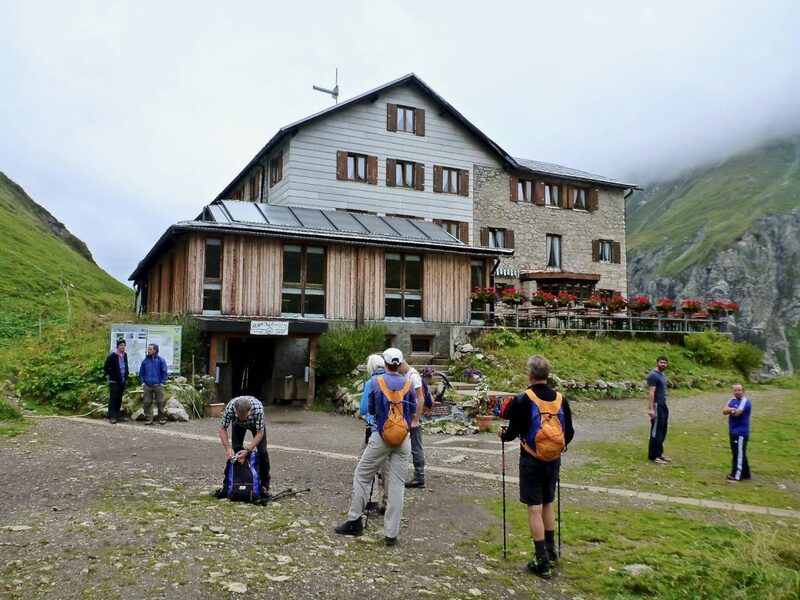 A hiker from another group twisted his ankle only 300 meters from the hut and he was picked up. The dinner was very nice and we enjoyed getting to know each other. We all introduced ourselves and talked about our reasons for crossing the Alps. When I mentioned my plans for hiking the PCT and that I was basically on a training hike the whole group was hanging on my lips. I also liked all the other stories. There was for example Monika who was 61. 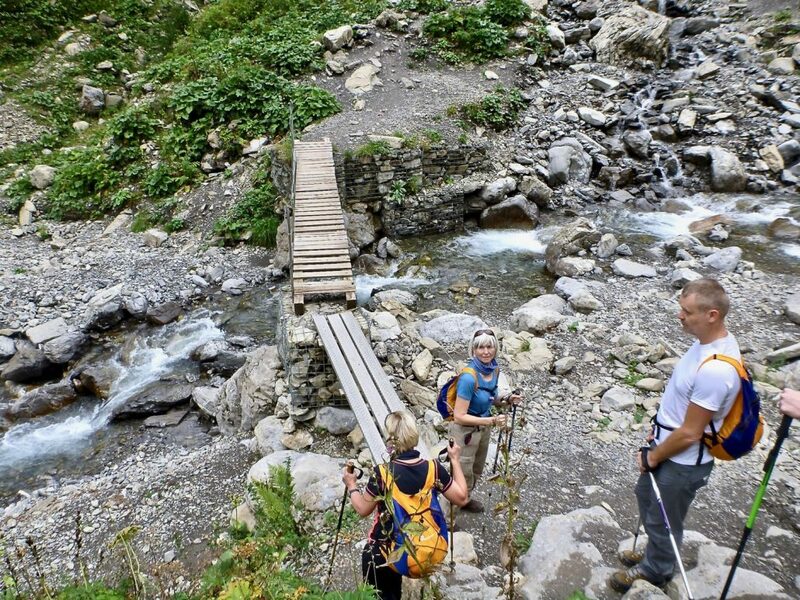 She told us that she lately took part in a special one-day-hike of 70 kilometers! The first day was over and I was very happy. I had some great people around me and the landscape already started to look very scenic. At that time I didn’t know that the next day would look completely different. Das ist mal wieder ein wirklich toller Bericht! Da kann man die Tour nochmal mit erleben! 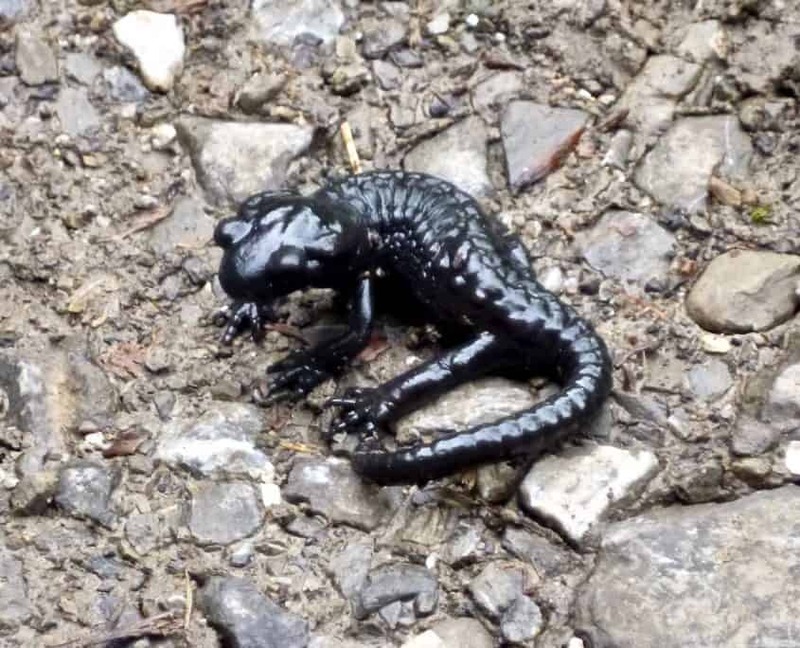 Es war wirklich ein einmaliges Erlebnis! Ich kann es kaum erwarten ihn zu lesen! Hi Ela, freut mich dass Dir mein Bericht gefällt. Ich habe es endlich mal geschafft über unsere super tolle Tour in den Alpen zu berichten. Das war eine ganz besondere Tour! Hallo Heidi, vielen Dank! Es war wirklich eine super Tour und endlich habe ich einmal die Zeit gefunden darüber zu berichten.